Does your child ever push others? Do you know how to teach her to use a different strategy to get what she wants? We love helping parents brainstorm ideas to help with their day-to-day parenting struggles. We share daily "reader questions" over in our Positive Parenting Zone Facebook group. Not long ago one of our readers asked a question about toddler pushing. Her 19 month old daughter had started pushing other children and she was frustrated! 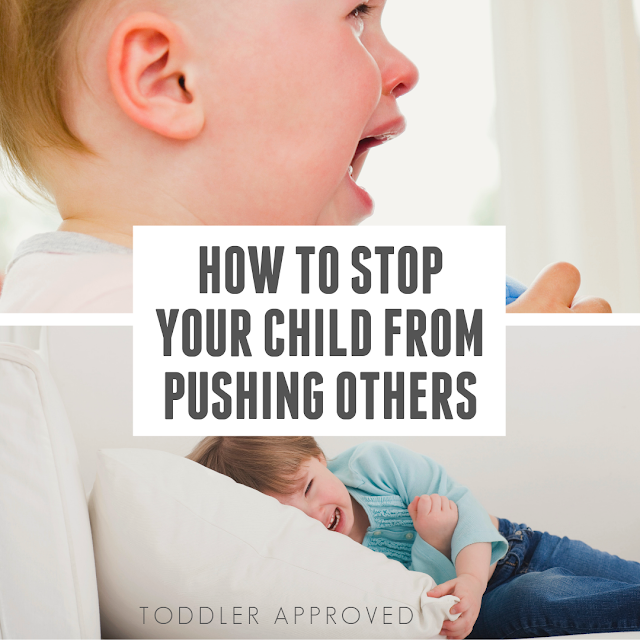 We've compiled some suggestions for toddler pushing that we shared with her and that we have found helpful! We've also include some ideas from other community members. You can find many of the suggestions for dealing with pushing below. Many of the strategies are similar to what you would use if your toddler was hitting. I'd love to hear additional things that work in your home! Toddler behavior is tough sometimes! Toddlers are still learning and need grown ups (and other kids) to help teach them appropriate behavior. Often they are trying to communicate something and are unable to express it appropriately with their words, so they use more physical ways to communicate. 1. Figure out what the child is trying to say and model the appropriate behavior! Behavior is a form of communication. Figure out what she is trying to say and then model the appropriate behavior. "You can ask if s/he wants to play. Can we play with you?" "No, no. We don't push our friends," or "we don't push babies." Sometimes parents have a tendency to get chatty with other moms while kids play together. You'll want to stay a little closer to your child to help facilitate communication till the behavior stops. I usually like to start by saying what I want the child TO DO first, followed by a reminder of what she shouldn't be doing. 2. Give the child appropriate language to use to talk to their friend. It can be so helpful! 3. Take a little break from play. Separate her from her "victim" and make a big show sympathy for the child she pushed. Then, hold your child's hands, gently, explaining that hands are for holding and helping. You can teach by example what gentle, nice, and softly mean. Practice together with dolls. She'll catch on. Sometimes kids are just overwhelmed and need a minute to calm down. We talk about why this child is crying and how we can help them. We also try to watch and see what triggers the incidents. Sometimes that is the key. Then you can better figure out how to help the child. For example, if you notice when there are too many kids that the child pushes, they may just be overwhelmed and need help managing that situation. 4. Show them what being gentle looks like. My 2-year-old old daughter was quite rough with her new baby brother and I found that the more I told her not to hit him, the more she wanted to. Instead, I took her hand and softly touched the baby while saying "gently... Gently". So instead of telling her what not to do, I showed her what to do and how. She never hurt him again. 5. Focus on the positive behavior you want to see. When you say "don't push" or "don't hit" the child first imagines hitting or pushing their playmate. It is better to say things like "Play nice," "Hands to yourself" and other positive words like that. Children aren't mentally developed enough to register the opposites of what you're saying. Saying "don't hit" is hard for them. They often don't realize that you mean "keep your hands to yourself." Remove them from the situation and divert their attention to something else. This will require you to keep a closer eye on your child who has a tendency to push other babies. It's a phase, so you just have to be patient and consistent with redirecting and correcting. 7. Focus attention on the child that is hurt! One reader shared the following... "What I have found that works best, taught to me by a behavioral specialist, is to focus your attention on the child that was pushed/hurt first. Get down with the hurt child, in sight of your daughter and say "oh I'm so sorry she pushed you. I don't like it when she pushes her friends. That must have made you very sad... Etc" Then have your child come to her and talk to them both about it and make her apologize. I used this with all types of challenging behaviors and got results quickly! Also, try to pay attention and see if there is a trigger for the pushing. Is she after a toy that child is holding? Is she trying to get your attention? At this age it takes some time to discover, but children are never just mean for the sake of it, there is almost always a "reason" why the behavior is occurring." Communication with kids needs to be appropriate to the situation and distance. If a child is about to run into the street, I would definitely yell. Talking calmly along with setting limits that are enforceable, simple and clear to understand, and reasonable based on the age of the child is almost always effective. One reason for pushing is that a child needs some rough and tumble play but seeks it out in the wrong way. Some are still little and don't always know how to ask for what they need. Maybe structured pillow fights or wrestling with a parent in the evening will meet the need. And then explain why this is allowed and pushing is not. Also heavy work can help kids regulate themselves better. Here are some great examples of heavy work activities from Your Kids Table. 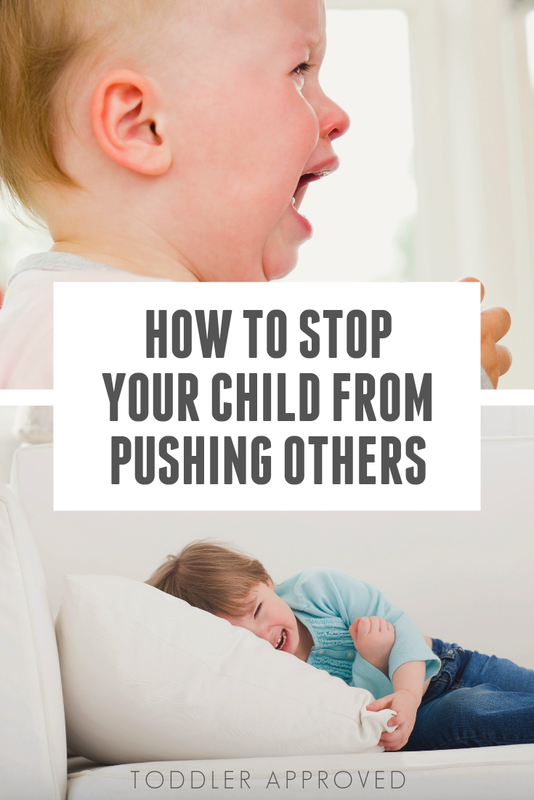 Have you tried any of these strategies when your child pushes others? Do you have any other positive strategies that have worked?